Be mesmerized by Clay Jenkinson, America’s foremost historical interpreter, as he brings to life three famous characters in different performances March 25 to 27. Jenkinson’s return to the Bryan Cultural Series will mark the eighth full season of outstanding performances. To kick off this season’s performance trio, he will bring Meriwether Lewis to life in performance at 7:30 Monday, March 25, at the Hilton Garden Inn, Kitty Hawk. “Lewis was my first Chautauqua character,” according to Clay. “He’s fascinating on so many fronts. When he was keeping his journal, he was easily the most interesting writer of the expedition, by magnitudes. Locals will not want to miss his interpretation of “Sir Walter Raleigh.” Raleigh will come to life during Jenkinson’s second performance on Tuesday, March 26 at 7:30 p.m. in the Sound Stage at The Lost Colony in Manteo. 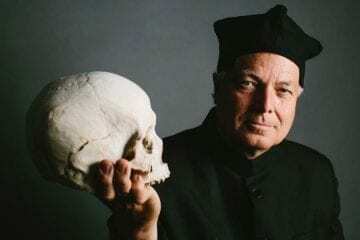 Jenkinson concluding performance will present Shakespeare, the Magic Words to the Outer Banks on Wednesday, March 27 at 7:30 at the First Flight High School, Kill Devil Hills. Jenkinson will appear in character to offer observations on issues, current and past. Jenkinson’s public performances take the form of lengthy monologues followed by Q & A sessions, while portraying the character (in costume) featured for that performance. At the end of his performances, he steps out of character and answers questions as himself. Jenkinson first came to the Outer Banks in April 2013 for the second performance of the Bryan Cultural Series, depicting Thomas Jefferson. His popularity warrante an invitation back the following fall, during which he debuted his depiction of Sir Walter Raleigh. His presentations of Thomas Jefferson have become the national model for scholars interpreting historical figures in the Chautauqua format. In a notable performance at the White House in April 1994, Jenkinson appeared as Thomas Jefferson. The audience included President Clinton and distinguished guests and took place on the 250th anniversary of the third president’s birth. This was the first public program in the humanities featured in a White House event. In 1988, Jenkinson received recognition for his groundbreaking work when he was one of the first five citizens to receive the prestigious National Endowment for the Humanities Awards for Excellence, presented by President George H. W. Bush. An American humanities scholar, author, and educator, Jenkinson currently serves as the director of the Dakota Institute, where he co-hosts public radio’s “The Thomas Jefferson Hour.” Jenkinson has visited with audiences as a public scholar of Jefferson’s ideas and views in thousands of programs throughout the United States. Additionally, he creates documentaries, films, symposiums, and literary projects. Tickets for each performance are $15 in advance and are available at bryanculturalseries.org. Tickets may also be purchased at the following locations: Gray’s Department Store, 3860 N. Croatan Hwy., Kitty Hawk; Sea Green Gallery, 2404 S. Virginia Dare Trail, Nags Head; Duck’s Cottage Downtown Books, 105 Sir Walter Raleigh St., Manteo; and Duck’s Cottage Coffee & Books, 1240 Duck Rd., Duck. Free tickets are available for all Dare County School students, faculty, and staff. For more information check PeachJar, email tickets@bryanculturalseries.org, or call or text (252) 564-9767. The Bryan Cultural Series is a non-profit organization formed in 2012. The board of directors is composed of nine community leaders dedicated to offering a series of high quality cultural events. These events will include a variety of visual, literary, and performing arts. The board strives to glean from talent that has attained regional, as well as national recognition, to maintain a high standard. Substantial support for this annual cultural offering of events is provided by Village Realty, Dominion North Carolina Power, Towne Bank of Currituck, Hilton Garden Inn of Kitty Hawk, Ramada Plaza Hotel of Kill Devil Hills, and Vidant Heath Services. For more information about these events visit bryanculturalseries.org.